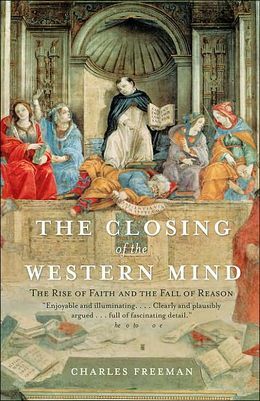 The Closing of the Western Mind by Charles Freeman is an erudite and well-written history of the formation and development of the doctrine and structure of early Christianity from its inception to the High Middle Ages and the arrival of Aquinas. Freeman begins the book with an interesting device in that, rather than leap directly into the historical record, his first chapter takes the reader through a short summary of what he sees as the two main forces opposing each other during the period covered by the book: the Greek tradition of rational philosophical inquiry and the Christian principle of faith. It is the tension between these two forces that provides the work with its backbone as well as its subtitle, The Rise of Faith and the Fall of Reason. Once he delves into a detailed account of the formation of Christian doctrine, Freeman’s gift for clear and fluid prose becomes apparent. The story he tells is one that has the potential to become dry, as it involves a large number of people, places and sects with unfamiliar names in a remote time period making arguments that are, at times, nuanced. It is to Freeman’s credit that the narration moves along smoothly at all points, never becoming bogged down in too much detail or unclear language. Having said that, I don’t mean to suggest that the book is a light read, as it is not. Freeman has done a vast amount of scholarship to support his conclusions (there are over sixty pages of notes and ten of bibliography) and he delves into the nuances of the different ideas and doctrines current during the early years of Christianity with impressive authority. While Freeman is not biased, his general approach is critical of the early Christian church and its doctrine, as evidenced by two particular themes that recur throughout the book. The first is the effect that realpolitik considerations had on the development of the Christian church and its doctrine. To give just one example, Freeman documents in meticulous detail the formation of the Nicene Creed, the doctrine specifying that the Father, the Son and the Holy Ghost are at the same time different but the same. This is now considered a central tenet of Christian belief, but it became official doctrine only at the behest of Emperor Constantine. Further, Constantine’s motivations were practical rather than religious: he wanted to quell the constant infighting and intrigues that plagued the religious establishment of the Roman Empire during his reign. Freeman details how, rather than being something solidly based in scripture, the Nicene Creed was one of many competing theories regarding the relationship between Jesus and the Christian God, and he goes on to explain the pragmatic political considerations that led Constantine to throw his weight behind it and not one of the other views, such as Arianism. The results of this philosophical incoherence in Freeman’s mind are clear, though they are not the same throughout society. In the political arena, Freeman notes that the desire among successive emperors to force orthodoxy stemmed from the desire to maintain social order by quelling the unrest caused by the bickering of rival factions. Among the clerical elite, the attempt to make sense of the scriptural legacy and reconcile its different parts led to a profusion of scholarship, though of a limited nature and denuded of curiosity and the free thought needed to do anything but additional study of scripture. He dryly comments on St. Augustine’s relation of a reference to teeth in the Song of Solomon to both saints and the newly baptized by saying, “With imagination allowed such a free rein, difficulties in finding scriptural sources for church doctrine are easily dissolved” (p. 288). Due to Freeman’s perceived favoring of the classical pagan philosophical tradition in comparison with early Christianity, it is somewhat surprising that he spends relatively little time in the book discussing the tradition that was displaced by the rise of Christianity. In a way, the picture of paganism that emerges from Freeman’s work is one that is drawn in the negative space not colored in by Christianity, much like a Frank Miller drawing. Where early Christianity was aggressive, paganism was quiescent; where early Christianity was intolerant, paganism was welcoming; where early Christianity stressed faith and obedience, paganism encouraged reason and inquiry; where early Christianity tore itself apart arguing about differences in interpretation and dogma, paganism inherently allowed for differences of interpretation. For readers interested exclusively in the paganism of the late classical period, there may be other works that offer more direct satisfaction, but that should not deter those who are interested in understanding the intellectual tenor of the time and how one tradition replaced another from tackling Freeman’s book. It is a rewarding read. I greatly enjoyed your commentary. Have you read Freeman’s “sequel” if you will? “A.D. 381: Heretics, Pagans, and the Dawn of the Monotheistic State” It is also a great book worth reading.